On one of those rare days in February 2013 when the sun shone, and it seemed for a while as if the long winter was coming to an end, before the onslaught of the snow blizzards which would punctuate March and early April, I set off into the hills south of Ipswich. Shelley was one of my goals. It isn't just a pretty name, it's a lovely place; but if you want to see it, you will have to find it first. Shelley must be among the most remote of all Suffolk villages, particularly when approached from the south. No major road goes anywhere near, and you will need to remind yourself that you are less than seventy miles from central London. Coming down from the hills, you find a simple street hugging the River Brett, which gently bottoms out here. Houses are old and scattered, and you could easily miss the church with its low tower as you take the corner. The tower is worth a second glance, for several reasons. Firstly, its unusual location; it stands to the north of the nave - indeed, because the south aisle extends fully westwards, it appears to be behind the church. In a rare misreading of his notes, Mortlock suggests that it is also the main entrance, but this is not the case; the north side of the churchyard is hemmed in quite severely, and you enter directly into the south aisle from a pretty little wood and brick porch. The Sanctuary is plain and fitting, very Anglican in its simplicity. Also very Anglican is the elegant Elizabethan pulpit, a rather sturdy example of the wineglass style. On a previous visit some ten years ago the nice churchwarden had informed me that it had 'recently begun to wobble', so he'd cemented it in more securely. He also showed me the pieces of an organ in the south aisle, which had come here from Woodbridge St John. He told me that he'd brought it over bit by bit in his car, without the least idea of how to put them together! However, I was pleased to find it now all in its proper place and in working order. Many people who come to Shelley will do so to see Dame Margarett Tylney. Her effigy lies in a window embrasure to the west of the pulpit - rather unnervingly, a preacher must look down into her sleeping face. It is strange to think that, from this very pulpit, a 16th century Minister could have looked down into her face when she was awake - or at least, one assumes so. She wears a ruff and a black dress, the very model of Elizabethan piety. She died in 1598, shortly before the Tudor dynasty ended - she was part of its last gasp, and barely forty years separate her from the madness of the Commonwealth and the vandalism of the Puritans - she looks from another age. She is probably in the wrong place. There is an alcove in the north chancel wall that may have accomodated her, and some shields further east may have come from the same place. 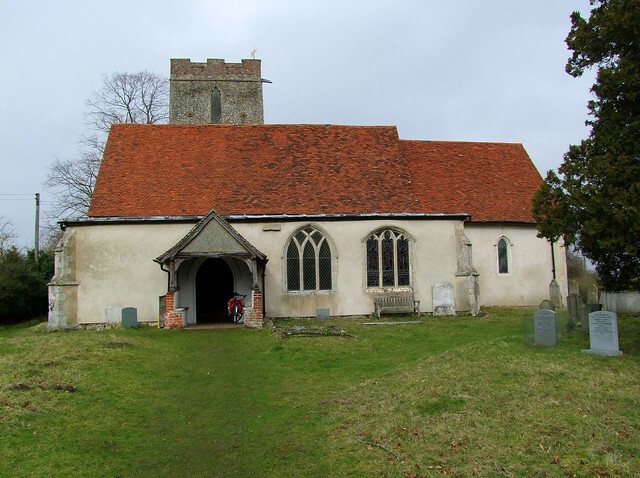 Although the medieval structure that survives here is considerable, like virtually all churches to the south of Hadleigh it was thoroughly scoured and reinvented by the Victorians. This is not necessarily a bad thing, and as much as Dame Margarett might have resented being shifted out of the chancel, the restoration left Shelley with a lovely little village church that is at once beautiful and dignified, and also in reasonable condition. I'm sure that she would have approved of that. Her sleeping effigy was witness to a quite extraordinary event in the early years of the 21st Century. In 2003, archeologists working in Jamestown, Virginia discovered the remains of a body which had been buried with obvious ceremony at the James Fort heritage site. There was a theory that it could be the corpse of Captain Bartholomew Gosnold, a Suffolk-born adventurer who led the pioneers that established the first English colony in the New World at Jamestown in 1607. A certain amount of DNA was recovered, and the only way of establishing for certain the identity of the corpse was to find a match from a source known to be of the same family. Gosnold's sister Elizabeth Tilney Gosnold had been buried in the vault of Shelley church, and permission was given for the vault to be opened and a DNA sample obtained. James Halsall, the Diocesan Secretary, explained to the press at the time that permission was given because of "the strength of the educational and scientific rationale presented to us by the Jamestown team". The Victorian tiles were removed from the chancel floor, then the 18th Century bricks below them, and then the 17th Century flagstones. A small amount of DNA was obtained from the corpse of Elizabeth, and lo and behold it was a match. A brass plaque on the chancel wall recalls the event and remembers Elizabeth.